SIMA’s SPIRAL 26 spiral bending machine is specially designed to produce spiral or hoop rebar, whether at the job site or in the workshop, for structures used in many circular reinforced concrete formworks, such as foundations, scorings, water dams and reservoirs, domes, arches, tunnels, and round pillars and columns. Our rebar spiral benders can shape a minimum diameter of 6mm (1/4" - #1) up to a maximum of 26mm (1" - #8) or 36mm (1- 3/8" / #11), depending on the machine model and the rebar strength (grade). No need to pre-bend the leading end of the rebar. Double speed operation, 7 or 14 meters (23 ft. or 46 ft.) per minute. Adjustable central cog-wheel for spiral or hoop curve radius. 2 ramps with rollers for pitch adjustment. Complete control panel, including emergency stop button, on/off switch, warning lights and operation selector switch. Only robust equipment can stand up to the task of shaping rebar for many years, which is why SIMA’s rebar spiral machines are made from highly resistant stainless materials. Free shipping and returns on all spiral bending machines to the UK. 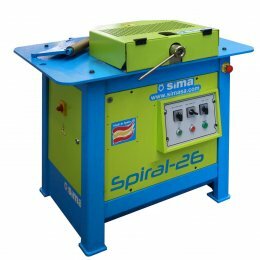 Our spiral bending SIMA SPIRAL 26 is: Max. bending Ø: 26mm. Engine: Electric three phase 415V. Power: 2.5KW. Precise angle adjustment through pins and inductive sensors, and much more reliable than machines with standard limit switches. SIMA SPIRAL-26 rebar bender is dirt and water proof and safety pedal operated. No need to pre-bend the leading end of the rebar before feeding into the spiral bender. Spiral bending machine can create both left- and right-handed spirals. Our rebar bending machines feature lateral short rulers with holes for pins, allowing for accurate tuning on angle adjustment (models DEL 32 and DEL 36). Models DEL 45 and DEL 52 feature lateral long rulers which allow double bends for "Z" shaped figures (bottle neck shapes). Cast-iron shear body and gearbox case ensure heavy duty performance and endurance with the lowest possible maintenance. Rebar spiral bending machines feature an oil bath, as well as trapezoidal and helicoidal gears. For operator safety, safety shield with a limit switch on the shear body and bending table is included. Easy and simple operation—it does not require highly qualified operators. All the necessary pins, rollers and mandrels, as well as the adjustable stop ruler are supplied as standard equipment. Pins and rollers can be customized upon request to suit to our customers’ requirements. Control panel designed and built in accordance with CE regulations. Buy directly from spiral bending machine manufacturers to ensure the best price, highest quality, and most comprehensive customer service.